The friendly football match raised a total of RM30,000 for two children’s charities. Granted, the movie Invictus is about rugby. Not football. Portraying the real-life events faced by Nelson Mandela as he struggled to unify a racially divided South Africa through the national rugby team, it captures beautifully the spirit and times of a country still letting go of the ghosts of apartheid and how sport really can bring people together. But it is in this very spirit that luxury timekeeper Hublot first conceived its special Match of Friendship games, demonstrating in the flesh the power of sport, be it rugby, football or anything that centres around the human spirit of achievement, hard work and a desire for excellence. The first such games took place on the eve of the UEFA Euro 2016 championship, just before the big kick-off, where the timekeeping maison brought together two of the sport’s greatest names — Pelé and Diego Maradona — to spearhead a friendly match at the Palais Royal in the heart of Paris. The mechanics were simple: Assemble two living legends as coaches to head two teams, comprising 10 iconic names in football and used to competing against each other, to play a short match in the spirit of the beautiful game. Sounds easy, doesn’t it? As amazing as the idea sounds, it actually made perfect sense as it is completely in keeping with Hublot’s position as the first luxury brand to support and invest in football in a major way, from specially designed watches to partnerships with iconic clubs and legendary players. As Ricardo Guadalupe, CEO of Hublot, said at the inaugural Match of Friendship, “it is a match that says a lot about Hublot’s involvement and the ties it has woven over the past decade in the world of football, by teaming up with prestigious clubs, star trainers, magicians with the ball and the best leagues”. 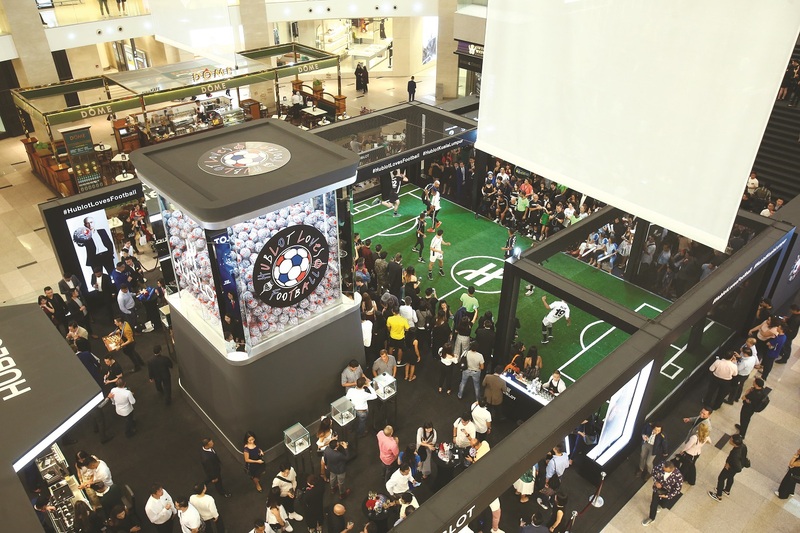 Tapping into this and also to celebrate the spirit of the 2018 World Cup in great style, the recent Malaysian edition of the Hublot Match of Friendship was no less iconic, putting together two teams whose personalities spanned the local sporting, corporate and entertainment industries. 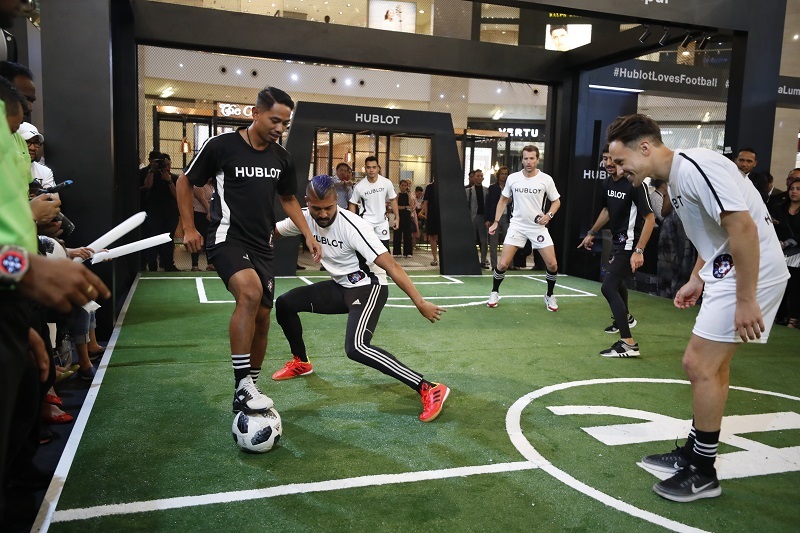 There was eminent rapper and friend of Hublot Joe Flizzow as well as television host Alif Satar, while national footballers Darren Lok and Mohd Safiq Rahim were roped in to ensure that there was plenty of professional on-pitch action. What made this match extra meaningful was that each team played under a specific charity banner. In white was Team Make-A-Wish, in support of Make-A-Wish Malaysia, the children’s charity that creates life-changing wishes for children suffering from critical illness, while Team OrphanCare, in black, represented the OrphanCare Foundation, whose tireless work gives children in institutions as well as unplanned newborn babies whose lives are at risk the chance to grow up cared for by loving families. Hublot and The Hour Glass Malaysia had generously put together a prize purse of RM15,000 for the winning team, RM10,000 for the runner-up and an additional RM5,000 in goodwill to the runner-up. Although the match was scrappy but spirited, there was action aplenty with a slew of goals scored in the friendly. Entrepreneur Roen Cian Nagapan alone scored a glut while Safiq, captain and midfielder of both Johor Darul Ta’zim FC and the Malaysian national football team, scored two. Syed Adney Syed Hussein, Joe Flizzow and Lok netted a goal each for their respective teams while Teh made a blooper and scored an own goal. The final tally was in favour of Team Make-A-Wish with six goals to Team OrphanCare’s five. By the evening’s end, the event contributed a total of RM30,000 to the two charities, whose representatives were present to receive it. As exciting as the match was, few would argue that this was the best result of all. No wonder football is called ‘the beautiful game’. Roen Cian Nagapan scored a whopping five goals, known in football parlance as a “glut”. For the uninitiated, two goals is referred to as a brace; three, a hat-trick; four, a haul; six, a double hat-trick, and seven, a haul-trick. This article first appeared on July 9, 2018 in The Edge Malaysia.